Annisquam Herb Farm: Spring along the coast . . .
Spring along the coast . . .
Well, yes it is Spring & we had a bit of hail yesterday. Glad I covered the kale, broccoli and cauliflower I had moved from the cozy greenhouse to the Back Forty. Not that the plants would have been discouraged but they were still quite tender looking. 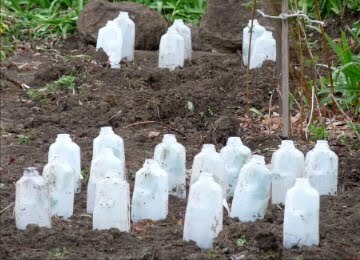 The half gallon milk containers with the bottoms cut off make it easy to cover a few plants in this small garden. Have considered row covers but am not there yet. In between the rows with plants are a few seeds - kale, broccoli and cauliflower. Along the right side of the photo you can see the raspberry bushes that are doing very well and need some serious disciplining every year. They could take over the garden in a very short time!